The San Luis State Park, known locally as San Luis Lakes, is located 15 miles west of the Great Sand Dunes National Park. 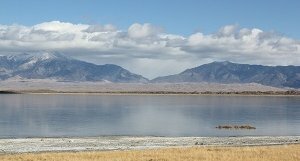 San Luis Lakes offers magnificent views of the Great Sand Dunes and Sangre de Cristo Mountain Range at every camping and picnic spot as well as a lake for boating. San Luis State Park is very easy to find as it is so close to the Great Sand Dunes. If you are coming from the east (Walsenburg area) take Highway 160 just past the town of Blanca. Go north on Highway 150 for 13.5 miles. Turn left on Six Mile Lane and drive for about 8 miles. Turn north into the park entrance. If you are already in the San Luis Valley take Highway 17 to the Six Mile Lane and turn east. Drive approximately 7 miles then turn north into the park entrance. There is a daily parks pass required for each vehicle which costs $7.00. Campsites are an additional $20.00 per night. The park is open year round, but the campground is closed from October to May. San Luis Lakes is a perfect spot to stop for a picnic after a day at the Great Sand Dunes. 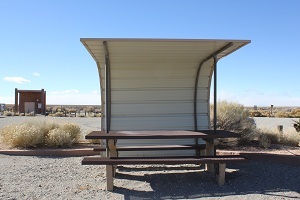 The main picnic area is Needles Picnic Area which is located near the boat ramp. It is just off to your right after you pay the entrance fee. This picnic area also has restroom facilities. There are also additional picnic sites along the western shore of the lake. Most picnic spots can accommodate groups. 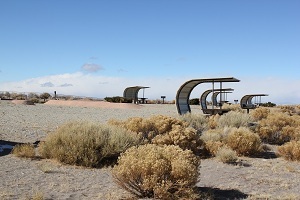 There are 51 campsites in the park located in the Mosca Campground. They all have electrical hookups, sheltered tables and fire grills. There are also drinking water hydrants and an available dump station. There is a bathhouse that has modern restrooms, hot showers, and laundry. The campsites can accommodate motor homes, trailers, and tents. The sites are first come, first serve or by reservation. The camping area is only open May 15th through Labor Day. Each campsites costs $20 a night for regular campers and $11 per night Sunday through Thursday for Aspen Leaf Pass Holders. A state parks pass is also required on each vehicle. San Luis State Park allows water skiing, motor boating, fishing, windsurfing and sailing, depending on the water levels. It is a sandy, shallow lake with sloping sides and few hazards, but no swimming is allowed. It is very critical that boats do not cross the wildlife area buoy line at the north end of the lake. This is to protect the valuable waterfowl nesting habitat. Each year the lake levels vary with the amount of snowfall. Some years the lake is too low and only hand launched boats are allowed. There are four miles of wide, level gravel trails in the wildlife area for hiking and mountain biking. This is a great way to experience the low dunes and wetlands. When planning your trip keep in mind that the wildlife area is closed from February 15 until July 15. When on these trails you will feel the fresh mountain air, see the wonderful views, and much wildlife. It is a great place to relax and go for a gentle hike. I enjoy parking as far north as the park allows and then hiking around the lake and wetland area. I almost always see a great variety of birds and other animals. It is important to stay on the designated paths to help protect the native plants and animals from human disruptions.